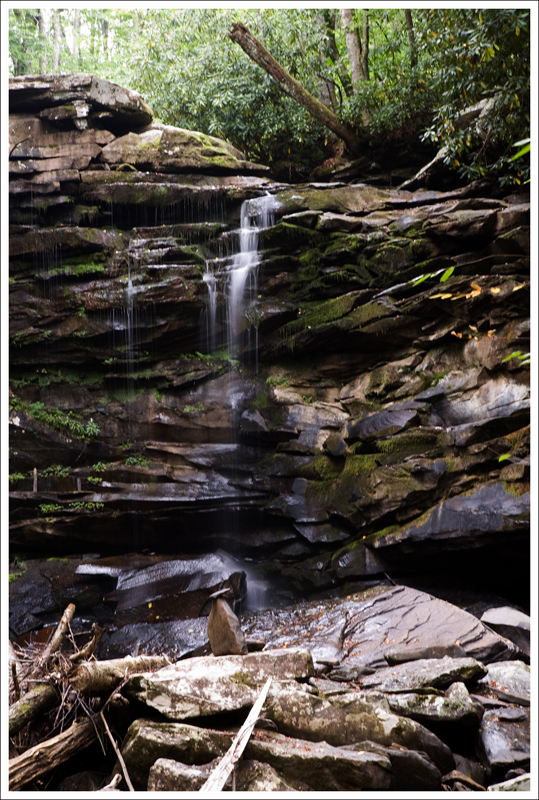 The Falls of Hills Creek is a popular trail that (should) give you views of three plunging waterfalls in a short distance. 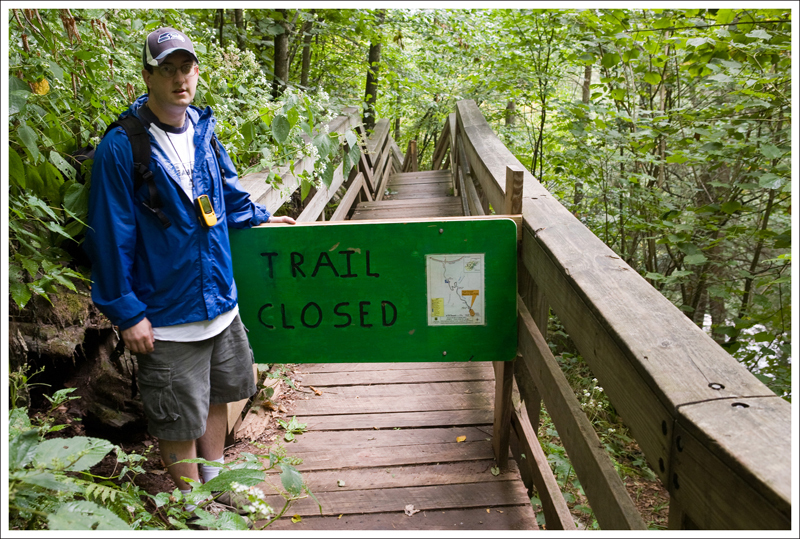 The trail is in need of some serious maintenance, as the lower – and most impressive – falls are completely inaccessible due to a collapsed boardwalk (as of fall 2010). While the waterfalls were practically non-existent due to very little rain for the past few months, the trail was still pretty. Below: We climbed many stairs and saw very little waterfall action; the Middle Falls were practically dry – the Upper Falls were completely dry and we didn’t even bother with photos; The path was scattered with fall leaves. In planning our trip down to West Virginia, we had seen great pictures of the Falls of Hills Creek and thought it would be worth checking out. The trail starts from the parking lot on a paved path and begins to descend. The trail winds around while it descends. At .3 miles, you come to your first overlook of the 25 foot Upper Falls. You can’t really get great looks of the falls from the overlook, but we could tell there was not a lot of water flowing. After this overlook, the trail continues on crushed gravel. At .5 miles, you will come to an overlook that gives you nice views of the 45 foot Middle Falls from above. 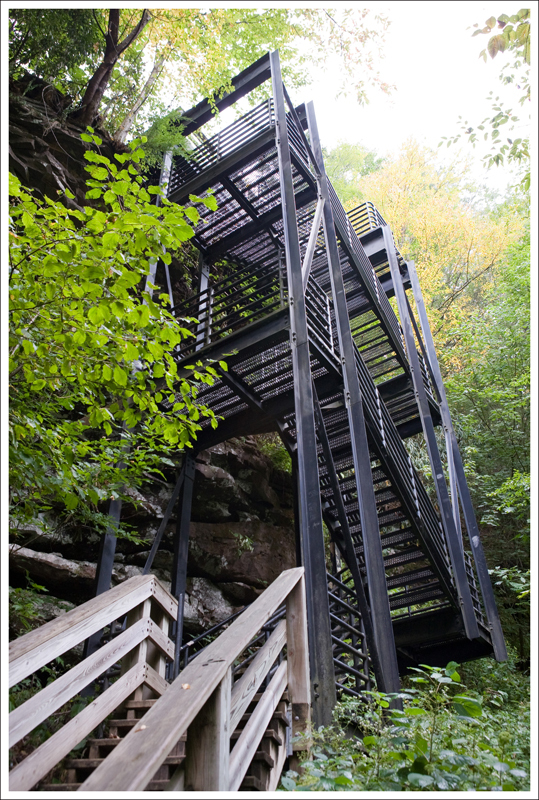 Many metal stairs lead to the lower viewing point for the middle falls. 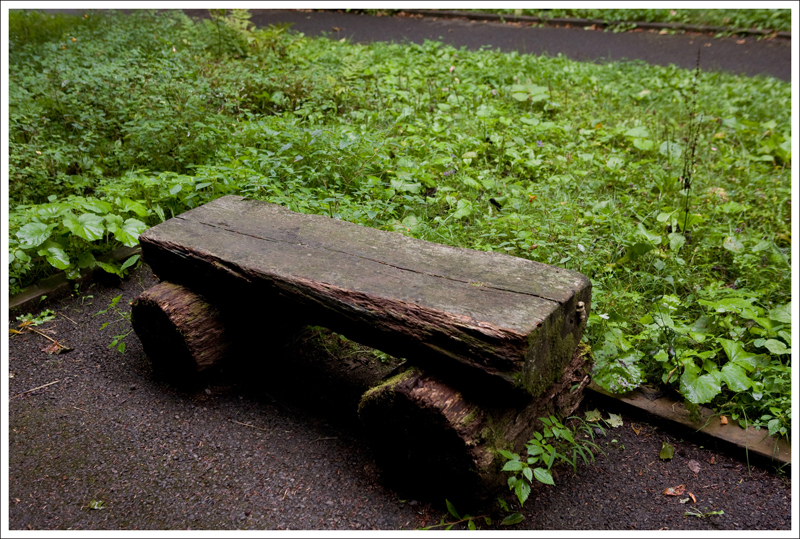 Below: Benches are available along the way if you need a rest; We saw a newt on the damp pathway; BUMMER! The trail is closed off before we even get a view of the waterfall. After you leave the platform, you will descend a metal stairwell that goes down several flights. At the bottom of the stairwell, the trail continues on a boardwalk. To the right is a short boardwalk path that gives you nice views of the Middle Falls from the bottom of the falls. 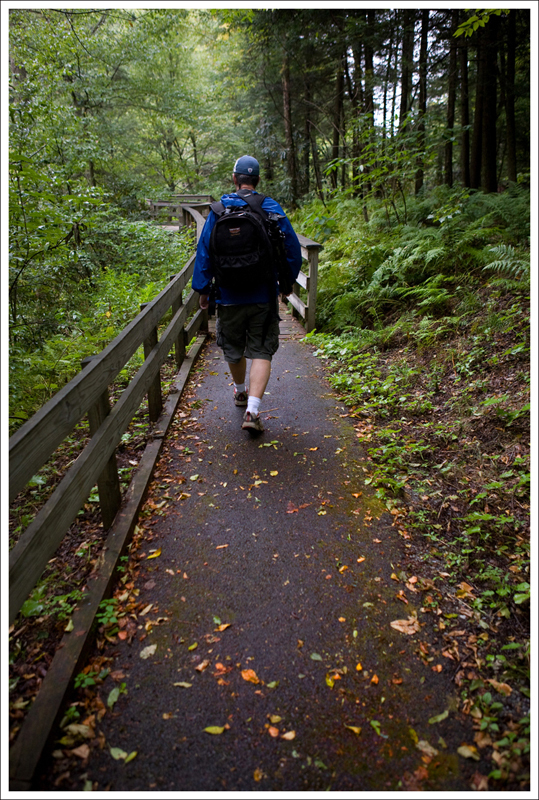 Go back up the boardwalk and take the path straight ahead that leads to the view to the Lower Falls. Unfortunately, there has been some damage from last year’s winter storm on this last section of the trail, so the boardwalk was closed. Even though the Lower Falls are supposed to be the most impressive with a 63 feet drop, we weren’t able to get to a place to see them. Return the way that you came to complete the 1.8 mile out-and-back. 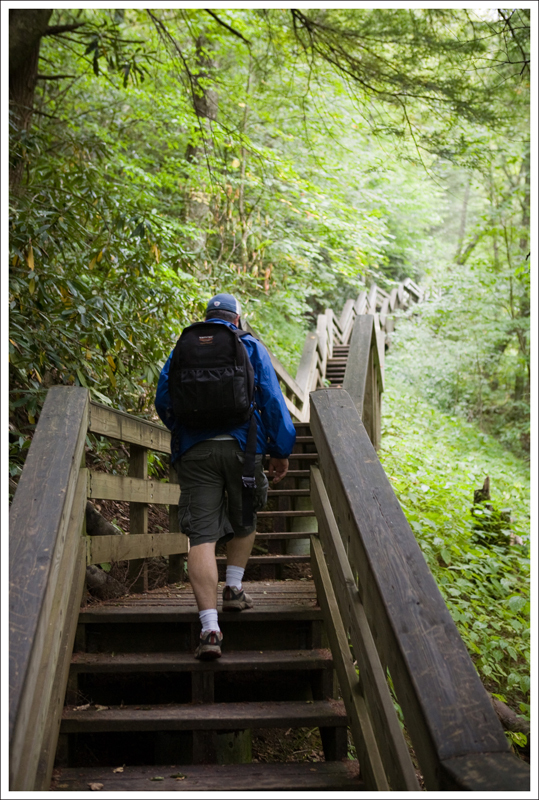 The way back includes a lot of stair climbing, so you will get a workout. The dry summer for the last month really hurt our ability to see these falls at the most impressive. I’m guessing that the work on the Lower Falls will not be completed until the spring/summer of 2011 (at the earliest), so I would wait until this is done to visit this series. The Lower Falls are considered the second highest cataract falls in West Virginia. 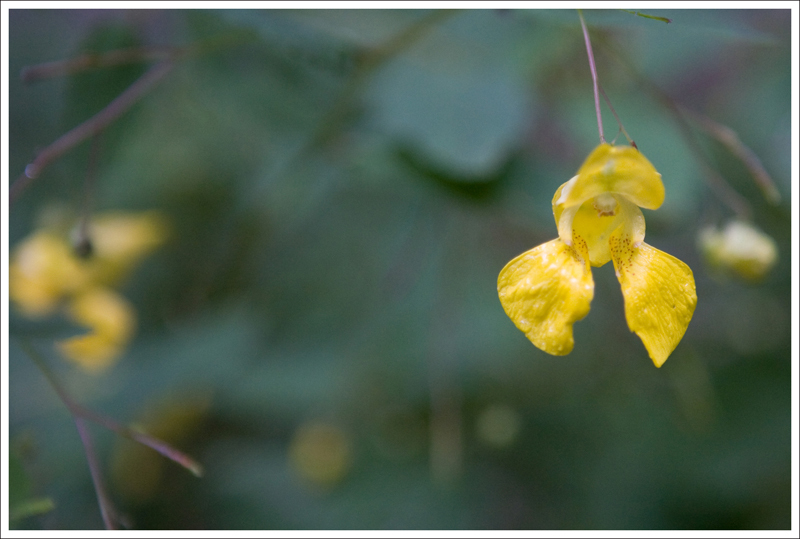 I’m a little ambivalent about including this hike on our blog because I don’t feel like we saw what the hike really has to offer. It’s hard to be enthusiastic and share information about a waterfall hike when the waterfalls are mostly dry, and one is not even accessible. But, the Falls of Hills Creek seem to be perennially popular, even in its diminished state. We did this hike the afternoon we arrived in Pocohontas County. It was a cloudy, dreary, drizzly day. I figured if there were any water left in the falls, this weather would be ideal for taking long exposure shots of the water. Even though the photos didn’t work out, the trail was still quite pretty. I enjoyed the cool, damp day and walking though the lush green of the woods. We got some good exercise in climbing the many stairs along the trail. 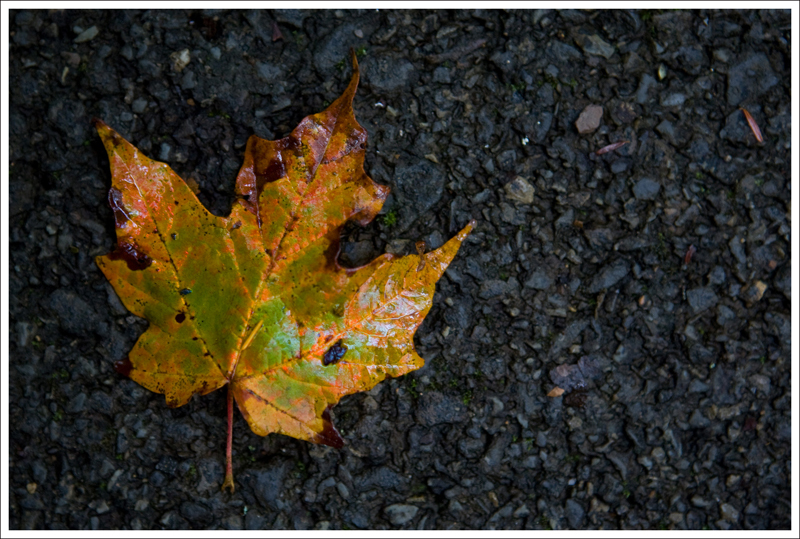 Signs of fall were all along the trail. 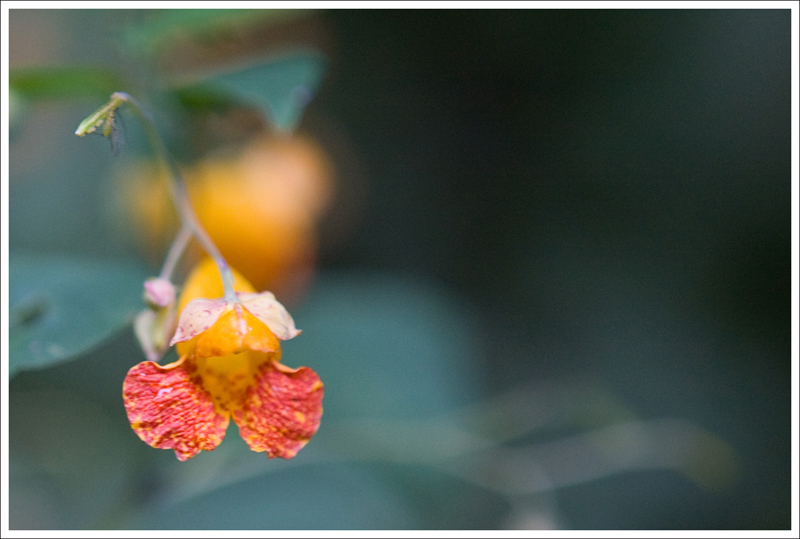 Below: Tiny wildflowers along the trail; The foreboding sign that made us carry 40 pounds of camera gear. 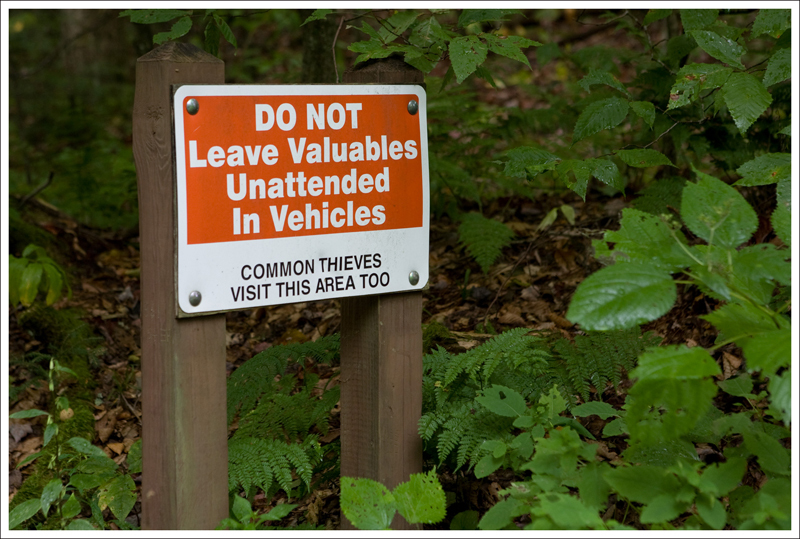 The one thing I found mildly disconcerting were the “thief alert” signs we found along the trail. When we walked down, I had all my camera gear and laptop in the car (unusual for me!) After I saw the sign, I took the route of paranoia and decided to carry everything with us. Adam carried the big backpack with the laptop and I carried the cameras and the tripod. It was kind of a shame, because we hardly used any of the gear we carried. I would love to see the Falls of Hills Creek again sometime when the water is flowing and the lower falls are open. Until then, I’ll reserve final judgment on this hike. Difficulty – 2. Just due to the stair-master quality of the hike, it’s not for everyone. Trail Conditions – 4.5. The trail is paved, then crushed gravel, and some boardwalk areas. Views –0. Not really any views other than waterfalls. Waterfalls/streams – 3.5 There wasn’t any water in the falls, but normally this would be great for waterfalls. Wildlife – 0. 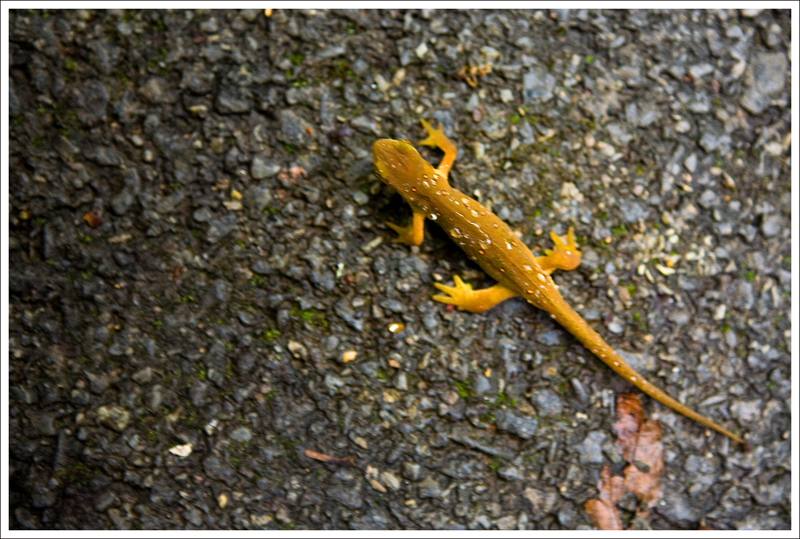 The trail is too populous to really attract wildlife. Ease to Navigate – 5. Just straight down a paved path and back. Solitude – 1. You should see people along this trail. Directions to trailhead: From Mill Point, WV head west of WV 39/55. 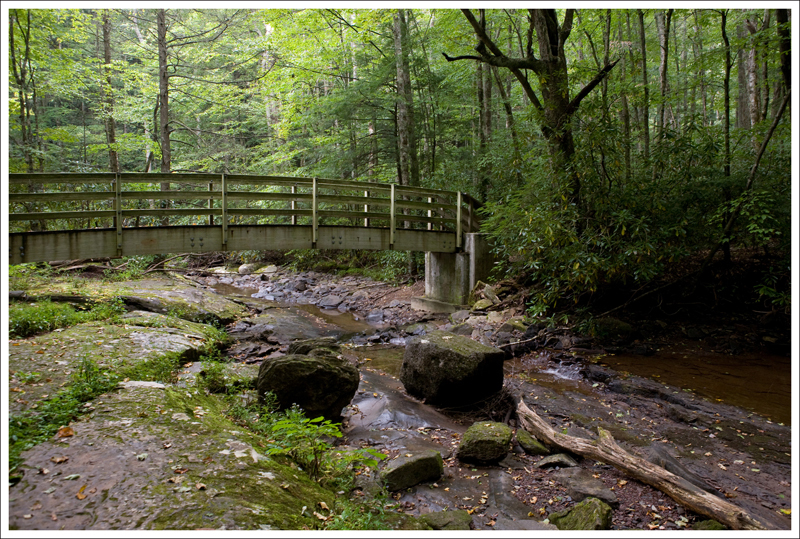 After about 12 miles, you will find a sign for the Falls of Hills Creek scenic area on your left that leads to a parking lot. The trail takes off from the left side of the parking lot.